Yellow Hypergiants (YHGs) are cool (Teff = 4000-7000 K), luminous (5.4 ≤ log L/L ≤ 5.8) massive stars evolving to the blue, hot side of the Hertzsprung-Russell (HR) diagram after having passed through the red supergiant (RSG) phase. Despite the fact that they are amongst the visually brightest objects, YHGs are rare, indicating that this evolutionary phase is short. Nevertheless, these objects are cornerstones in the evolution of massive stars, because they link the cool RSGs and the hot pre-supernova stages such as Luminous Blue Variables (LBVs) and Wolf-Rayet (WR) stars. Rho Cassiopeiae (Rho Cas) is a cool YHG, one of the most luminous cool massive stars presently known. It is a post-red supergiant, rapidly evolving toward the blue supergiant phase. With a spectral type of F8-G2 Ia0 (Teff= 6500-7200 K), and a luminosity of log (L*/Lsun)~5.7 (R*~ 400-500 Rsun), Rho Cas is one of a small sample of Galactic YHGs. This type of massive supergiant is very important to investigate the atmospheric dynamics of cool stars and their wind acceleration mechanisms. In quiescent variability phases Rho Cas looses mass at a rate of few 10^-4 Msun, which is intermediate for cool hypergiant stars, but can increase by two orders of magnitude during rare outburst episodes. These wind driving mechanisms are also important to study the physical causes for the luminosity limit of evolved stars. Position of a number of super- and hypergiant stars according to their surface temperatures and total intrinsic brightnesses (or luminosities). The surface temperatures of stars marked in the right-hand half of the figure are below 10000 K, and called cool luminous stars. The stars marked in the left-hand half of the diagram are hot (blue) luminous stars, such as the Luminous Blue Variables. The surface temperature of the Yellow Hypergiants Rho Cas, HR 8752, and IRC+10420 changes over time, marked with horizontal lines between the observed minimum and maximum temperatures. The blue horizontal line for Rho Cas shows the temperature change from about 7500 K to below 4000 K observed over about 200 days during a massive eruption in 2000-2001. Evolutionary tracks and possible membership of Rho Cas to the Cas OB5 association indicate a stellar mass of ~25 Msun and possible ages of 4 to 6 Myr. Observations of CNO-processed abundances in its extended Na-enriched atmosphere signal that the YHG has gone through dredge-up in the RSG stage, and is presently evolving bluewards. Rho Cas is about to cross the so-called atmospheric instability region in the upper HR-diagram: "the Yellow Evolutionary Void" (Fig. 1), where due to the enormous atmospheric scale height of these massive evolved stars, coupled with a large temperature in the shell-burning layers, the effective surface acceleration essentially vanishes, producing dynamically unstable stellar atmospheres. 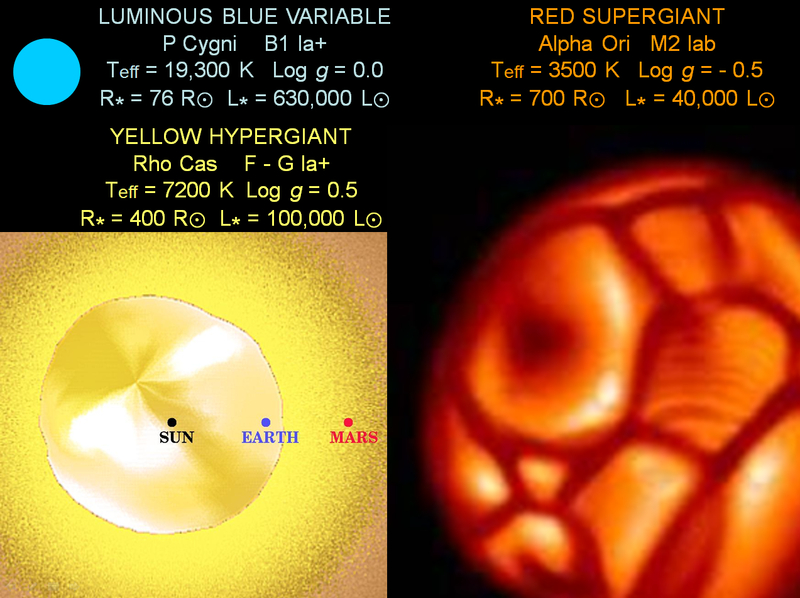 Comparison of the relative size of a typical Luminous Blue Variable (P Cygni), a Yellow Hypergiant (Rho Cas), and a Red Supergiant (Betelgeuse). 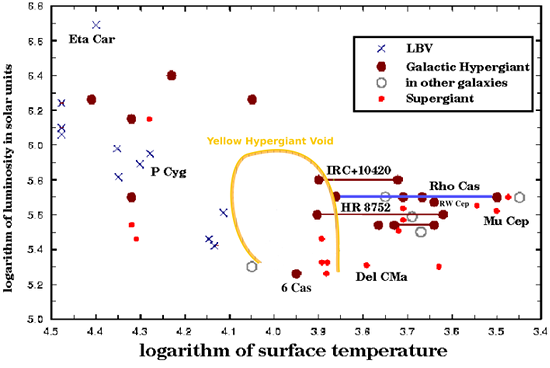 Fundamental stellar parameters such as surface temperature (Teff), gravity acceleration (Log g), photospheric radius (R*), and luminosity (L*) are also marked. Note that a YHG such as Rho Cas is a large star but which has a photospheric radius smaller than RSG Betelgeuse. Long-term spectroscopic monitoring observations indicate Rho Cas´s atmosphere is very unstable, with surging upward and downward currents of material due to vigorous atmospheric convection, a strong stellar wind blowing material outward, and other atmospheric activities that together give rise to pulsations of the surface temperature, brightness and size, in quasi-regular periods of about 320 days. During Rho Cas's pulsations the surface temperature changes by about 750 K, while the average radius of its visible surface changes by forty percent and averages a mean size of 400 to 500 times the radius of the Sun. Dynamic spectra of H alpha (panel left) and Fe I 5572 (panel right). The line profiles are linearly interpolated between consecutive observation nights over about 10 years, marked by the left-hand tickmarks (1994-2004). Notice the strong blue-shift of the Fe I line during the outburst of mid 2000. The outburst is preceded by very strong emission (white spots) in the short-wavelength wing of H alpha, while the absorption core extends longward, and the photospheric Fe I line strongly red-shifts. A strong collapse of the upper and lower atmosphere precedes this outburst. Rho Cas is a rare bright cool hypergiant, which we are continuously monitoring with high spectral resolution. Its He-core burning phase is accompanied by tremendous episodic mass-loss events, for example observed in an outburst event between 2000 July and 2001 April. Rho Cas's atmospheric instability is manifested in both its quasi-periodic photometric behavior and unusual spectral variability. It normally pulsates semi-regularly (Srd) with P= 320-520 d, and an amplitude of +/- 0.2 mag. 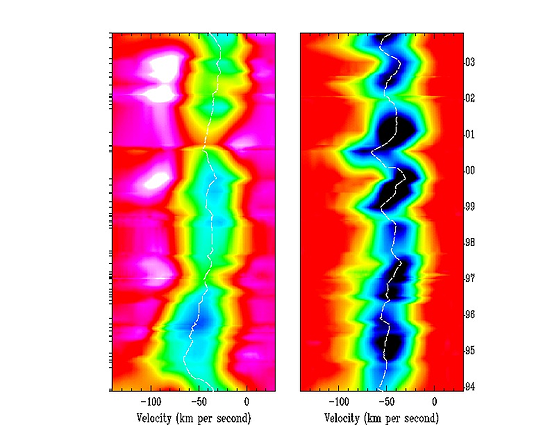 (V band magnitude). Once every 20 to 50 years, however, this hypergiant goes into an outburst by dimming more than a full visual magnitude, decreasing the effective temperature by more than 3000 K, and by ejecting a massive gas shell. An artist's rendition of the millennium outburst of Rho Cas. In January 2000 the visual brightness increased rapidly due to an unusually strong collapse of the lower atmosphere increasing the surface temperature above 7000 K. In early and mid-2000 the atmosphere rapidly expanded while the lines in the spectrum strongly Doppler shifted towards shorter wavelengths. The outer atmosphere accelerated supersonically and was partly expelled into space during the eruption. The entire upper atmosphere quickly cooled, changing the usual yellowish-white color of the star to orange. In the summer and fall of 2000 the temperature in the outer atmosphere decreased to below 4000 K. New molecules formed and appeared in the optical spectrum of Rho Cas. In the meantime, the lower atmosphere started to retreat and the spectral lines shifted back toward longer wavelengths. The cool circumstellar gas shell ejected by the explosion expanded further and became detached one year later, while the atmosphere contracted and the hypergiant's brightness and surface temperature increased to the levels before the outburst. In quiescent pulsation phases Rho Cas is a luminous late F-type supergiant. During a tremendous outburst of the star in 1945-1947 strong absorption bands of titanium-oxide (TiO) suddenly appeared in its optical spectrum, together with many low excitation energy atomic lines, not previously observed. These absorption lines, normally observed in M-type supergiants, were strongly blue-shifted, signaling the ejection of a cool circumstellar gas shell. 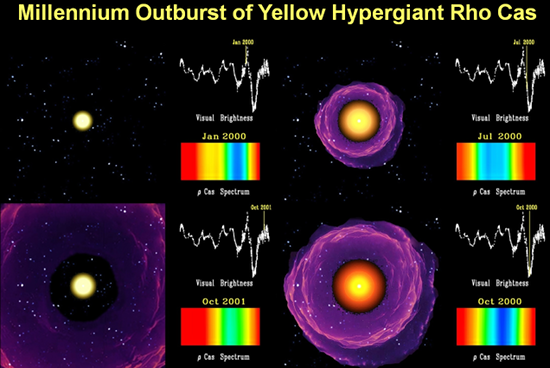 In July 2000 we observed the formation of new TiO bands during a strong V-brightness decrease by ~1.4 mag. Our synthetic spectrum calculations show that Teff decreased by at least 3000 K, from 7250 K to ~4250 K, and the spectrum became comparable to the early M-type supergiants Mu Cep and Betelgeuse. The TiO bands reveal the formation of a cool circumstellar gas shell with a gas kinetic temperature below 4000 K due to supersonic expansion of the photosphere and upper atmosphere. We observe a shell expansion velocity of v_exp=35 +/- 2 km/s from the TiO bands. 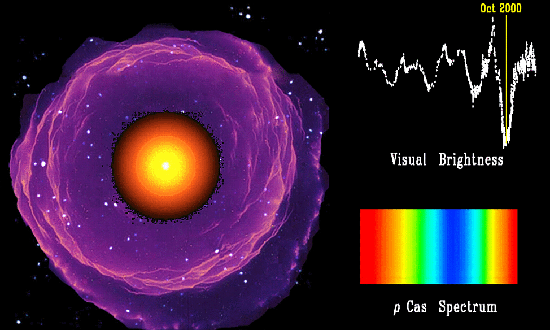 From the synthetic spectrum fits to these bands we compute an exceptionally large mass-loss rate of Mdot = 5.4 x 10^-2 Msun/y, comparable to the values estimated for the notorious outbursts of the Luminous Blue Variable Eta Carinae. Clockwise, from upper left: in January 2000 the brightness increases rapidly due to the strong collapse of the lower atmosphere; the surface temperature rises above 7000 K. In early to mid-2000 the atmosphere rapidly expands while the spectrum shifts toward shorter wavelengths. The outer atmosphere accelerates supersonically and is partly expelled into space. The entire upper atmosphere begins to quickly cool, changing the star's color yellowish-white to orange. In summer and fall of 2000 the temperature in the outer atmosphere decreases below 4000 K. New molecules can then form and appear in the optical spectrum. Meanwhile, the lower surface starts to retreat and the spectrum shifts back toward longer wavelengths. The cool circumstellar gas shell expands further, possibly becoming detached one year later, while the atmosphere contracts and the hypergiant's brightness and surface temperature increase to their levels before the outburst.